The nursing diagnosis Impaired Physical Mobility is defined as the limitation in independent, purposeful physical movement of the body or of one or more extremities. Use this guide for your impaired physical mobility care plan. A modification in movement or mobility can either be a transient, recurring or more permanent dilemma. And when it occurs, it becomes a complex health care problem that involves many different members of the health care team. In fact, some degree of immobility is very common in most conditions such as stroke, leg fracture, multiple sclerosis, trauma, and morbid obesity. The incidence of the disease and disability continues to expand with the longer life expectancy for most Americans. In most cases, even if patients are discharged from the hospital earlier than expected, they are transferred to rehabilitation facilities or sent home for physical therapy. Aging is also considered one of the factors concerning alteration in mobility. A decrease in muscle function, loss of muscle mass, reduction in muscle strength, gait changes affecting balance, and stiffer and limited mobile joints can significantly jeopardize the mobility of aged patients. Mobility is needed especially if an individual is to maintain independent living. Limited movement affects the performance of most ADLs. The human body is designed for motion; hence, any restriction of movement will take its toll on every major anatomic system thus resulting in impaired physical mobility. 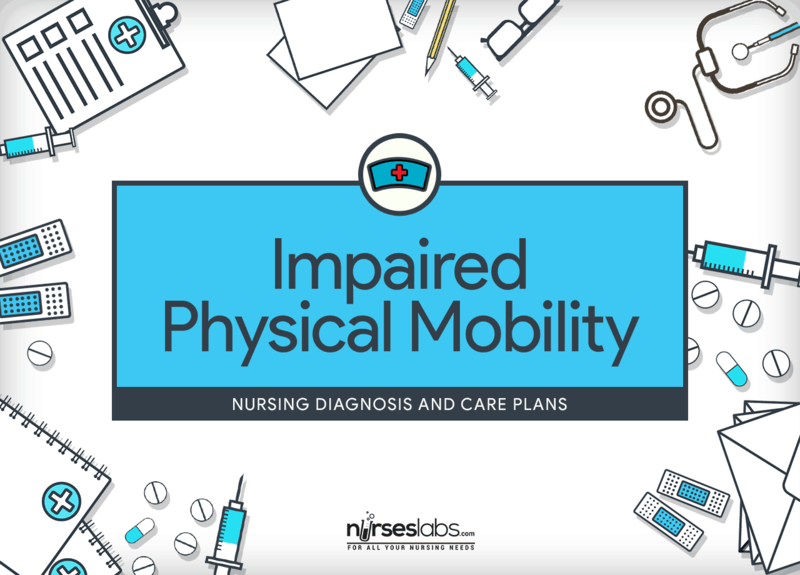 Here are some factors that may be related to the nursing diagnosis of Impaired Physical Mobility. Patient performs physical activity independently or within limits of disease. Patient is free from complications of immobility, as evidenced by intact skin, absence of thrombophlebitis, normal bowel pattern, and clear breath sounds. Impaired physical mobility represents a complex health care problem that involves many different members of the healthcare team. Ongoing assessment is essential in order to identify potential problems that may have lead to Impaired Physical Mobility. Check for functional level of mobility. Understanding the particular level, guides the design of best possible management plan. Evaluate patient’s ability to perform Activities of Daily Living efficiently and safely on a daily basis. Restricted movement influences the capacity to perform most activities of daily living. Safety with ambulation is a significant matter. Determines strengths or insufficiency and may give information regarding recovery. This helps out in preference of actions since different methods are used for the following: flaccid and spastic paralysis. Assess for impediments to mobility Identifying barriers to mobility (e.g., chronic arthritis versus stroke versus pain) guides design of an optimal treatment plan. Assess the strength to perform ROM to all joints. This assessment provides data on extent of any physical problems and guides therapy. Testing by a physical therapist may be needed. Assess input and output record and nutritional pattern. Pressure ulcers build up more rapidly in patients with a nutritional insufficiency. Monitor nutritional needs as they relate to immobility. Good nutrition also gives required energy for participating in an exercise or rehabilitative activities. Evaluate the need for assistive devices. Correct utilization of wheelchairs, canes, transfer bars, and other assistance can enhance activity and lessen the danger of falls. Assess presence or degree of exercise-related pain and changes in joint mobility. Examines development or recession of complications. May require to delay augmenting exercises and hold until further healing occurs. Assess the safety of the environment. Blockages such as throw rugs, children’s toys, and pets can further control and limit one’s ability to ambulate harmlessly. Assess the emotional response to the disability or limitation. Acceptance of temporary or more permanent limitations can vary broadly between individuals. Each person has his or her personal interpretation of acceptable quality of life. Consider the need for home assistance (e.g., physical therapy, visiting nurse). Obtaining suitable support or help for the patient can ensure a safe and proper progression of activity. Assess the patient’s or caregiver’s understanding of immobility and its implications. The risk for effects of immobility such as muscle weakness, skin breakdown, pneumonia, constipation, thrombophlebitis, and depression are also to be considered in patients with temporary immobility. Note for progressing thrombophlebitis (e.g., calf pain, Homan’s sign, redness, localized swelling, a rise in temperature). Prolonged bed rest or immobility allows clot formation in the impaired physical mobility nursing diagnosis. Check for skin integrity for signs of redness and tissue ischemia (especially over ears, shoulders, elbows, sacrum, hips, heels, ankles, and toes). Routine inspection of the skin (especially over bony prominences) will allow for prevention or early recognition and treatment of pressure ulcers. Note elimination status (e.g., usual pattern, present patterns, signs of constipation). Immobility promotes constipation, decreasing the motility of the gastrointestinal tract. Assist patient for muscle exercises as able or when allowed out of bed; execute abdominal-tightening exercises and knee bends; hop on foot; stand on toes. Adds to gaining enhanced sense of balance and strengthens compensatory body parts. Present a safe environment: bed rails up, bed in down position, important items close by. These measures promote a safe, secure environment and may reduce risk for falls. Clean, dry, and moisturize skin as necessary. Use anti embolic stockings or sequential compression devices if appropriate. Use pressure-relieving devices as indicated (gel mattress). This is to prevent skin breakdown, and the compression devices promote increased venous return to prevent venous stasis and possible thrombophlebitis in the legs. Execute passive or active assistive ROM exercises to all extremities. Exercise enhances increased venous return, prevents stiffness, and maintains muscle strength and stamina. It also avoids contracture deformation, which can build up quickly and could hinder prosthesis usage. Provide foam or flotation mattress, water or air mattress or kinetic therapy bed, as necessary. These equipment decrease pressure on skin or tissues that can damage circulation, potentiating risk of tissue ischemia or breakdown and decubitus formation. Promote and facilitate early ambulation when possible. Aid with each initial change: dangling legs, sitting in chair, ambulation. These movements keep the patient as functionally working as possible. Early mobility increases self-esteem about reacquiring independence and reduces the chance that debilitation will transpire. Show the use of mobility devices, such as the following: trapeze, crutches, or walkers. These devices can compensate for impaired function and enhance level of activity. The goals of using such aids are to promote safety, enhance mobility, avoid falls, and conserve energy. Help out with transfer methods by using a fitting assistance of persons or devices when transferring patients to bed, chair, or stretcher. Learning the proper way to transfer is necessary for maintaining optimal mobility and patient safety. Let the patient accomplish tasks at his or her own pace. Do not hurry the patient. Encourage independent activity as able and safe. Healthcare providers and significant others are often in a hurry and do more for patients than needed. Thereby slowing the patient’s recovery and reducing his or her confidence. Give positive reinforcement during activity. Patients may be unwilling to move or initiate new activity because of fear of falling. This is to boost the patient’s chances of recovering and to increase his or her self-esteem. Provide the patient of rest periods in between activities. Consider energy-saving techniques. Rest periods are essential to conserve energy. The patient must learn and accept his her limitations. Give medications as appropriate. Antispasmodic medications may reduce muscle spasms or spasticity that interferes with mobility; analgesics may reduce pain that impedes movement. Help patient in accepting limitations. Let the patient understand and accept his or her limitations and abilities. Assistance, on the other hand, needs to be balanced to prevent the patient from being unnecessarily dependent. Encourage resistance-training exercises using light weights when suitable. Strength training and other forms of exercise are believed to be effective in maintaining independent living status and reduced the risk of falling in older adults. Help patient develop sitting balance and standing balance. This helps out in retraining neuronal pathways, promoting proprioception and motor response. Turn and position the patient every 2 hours or as needed. Position changes optimize circulation to all tissues and relieve pressure. Keep limbs in functional alignment with one or more of the following: pillows, sandbags, wedges, or prefabricated splints. This avoids footdrop and too much plantar flexion or tightness. Maintain feet in dorsiflexed position. Encourage coughing and deep-breathing exercises. use suction as necessary. Make use of incentive spirometer. Coughing and breathing prevent buildup of secretions. Incentive spirometry increases lung expansion. Present suggestions for nutritional intake for adequate energy resources and metabolic requirements. Correct nutrition is necessary to keep sufficient energy level. The patient will need adequate, properly balanced intake of carbohydrates, fats, proteins, vitamins, and minerals to provide energy resources. Encourage a diet high in fiber and liquid intake of 2000 to 3000 ml per day unless contraindicated. Liquids maximize hydration status and avoid hardening of stool. It also decreases risk of skin irritation or breakdown. Set up a bowel program (e.g., adequate fluid, foods high in bulk, physical activity, stool softeners, laxatives) as needed. Note bowel activity levels. Sedentary lifestyle contributes to constipation. A variety of interventions will promote normal elimination. Offer diversional activities. Observe emotional or behavioral reactions to immobility. Forced immobility may heighten restlessness and irritability. Diversional activity helps in refocusing attention and promotes coping with limitations. Explain to the patient the need to call for help, such as call bell and special sensitive call light. In impaired physical mobility, this intervention allows patient to have a sense of control and lowers fear of being left alone. Set goals with patient or Significant Other for cooperation in activities or exercise and position changes. This enhances sense of anticipation of progress or improvement and gives some sense of control or independence. Reinforce principles of progressive exercise, emphasizing that joints are to be exercised to the point of pain, not beyond. “No pain, no gain” is not always true! Pain occurs as a result of joint or muscle injury. Further damage is expected if inappropriate movement is continued. Teach patient or family in maintaining home atmosphere hazard-free and safe. A safe environment will help prevent injury related to falls. Home modification can help the patient maintain a desired level of functional independence and reduce fatigue with activity. Give explanation about progressive activity to patient. Providing small, attainable goals helps increase self-confidence and reduces frustration. Very good information for nursing student and very easy fot learn.